Purpose: Develop programs and find ways to get more compliance in Registering foals and Transferring registrations. Purpose: Maintain grounds, infrastructure and equipment. Make recommendations for improvements. Purpose: Provide a comprehensive educational process to train and evaluate prospective judge’s according to the current MFTHBA rule book and the approved judging standard. Purpose: Recruit new members, retain the current members, and re‐enroll former members. Purpose: Plan, coordinate and make recommendations to the MFTHBA Board for their approval for the Spring Show and Three Year Old Futurity and the World Show and Celebration. 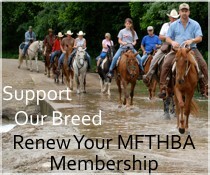 Purpose: Develop and implement a comprehensive sponsorship program for the MFTHBA. Purpose: Plan events, educate members, and encourage members to participate in trail riding. Purpose: Provide input, suggestions, and expertise to the MFTHBA board and membership from the MFTHBA trainer’s perspective. Purpose: Develop and administer MFTHBA youth appropriate activities and programs.